Ever since I told my sister-in-law about my blog, she's been one of my biggest supporters. She's always been very crafty and creative, but it seems to have been kicked up a notch lately. After seeing all the Easter decorations I had been working on, she wanted to add some things to our Easter decor. 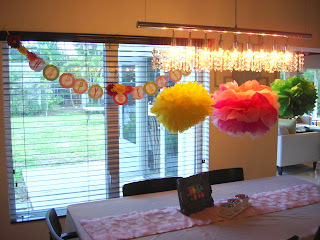 She made these adorable tissue paper poufs and the banner hanging on my window. 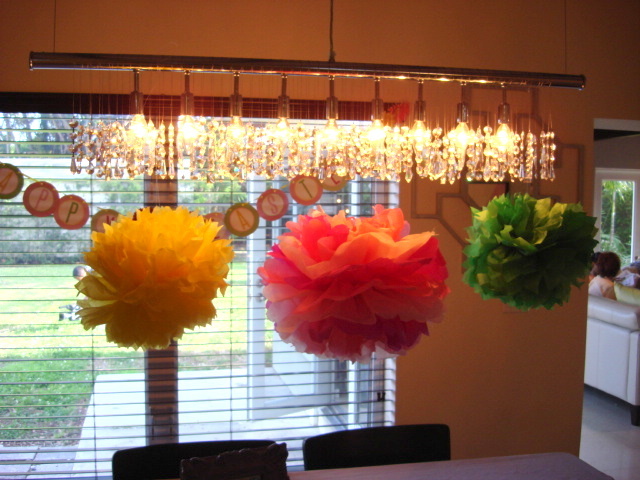 ﻿I wanted to feature her adorable projects here and I totally think she should start a blog of her own! Now, here's what I did. 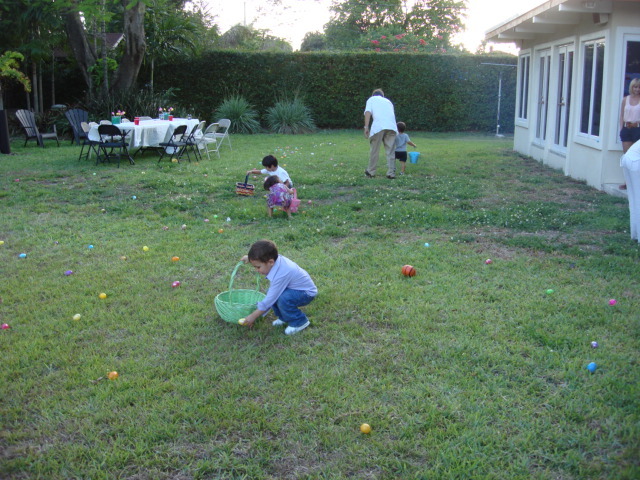 I, as host of our Easter dinner, set up the eggs for the hunt. I gathered, bought, and borrowed eggs to be filled. I spent last week filling them and sticking them in a bag. When in the bag, it really didn't feel like a lot of eggs. So I filled another bunch of them with stickers and candy. Well, when the Easter Bunny started laying the eggs, we kind of realized what I had done. The count (done after the fact) of eggs was like 300. Well, there were 5 kids...a 4 year old, 2 - 2 year olds, and 2 - 1 year olds. That's a whole LOT of eggs. I think like 15 per kid would have been good. To my defense, 4 of our friends kids were supposed to come. We had to get a bag to dump what was in the baskets so they could keep filling. It was pretty funny. Crazy Aunt! You can see here some of the eggs on the ground, trust me, there's a whole lot more. It was really a great weekend and the kids loved ALL their eggs. My husband made some great burgers. 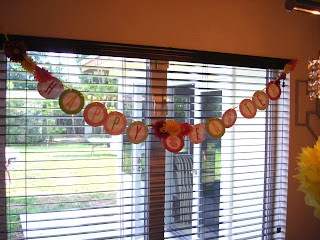 Thanks sis-in-law for all your help yesterday and for your ADORABLE decorations. How was your weekend? I think we had that many eggs for the 12-15 kids in our neighborhood at our easter egg hunt, which will always be memorable as a squirrel gnawed on one egg and stole another... guess he thought they might be delicious. 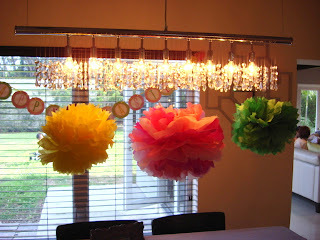 I love tissue paper puffs, they are an easy and quick way to add a lot of color to a partyscape! We did our Easter egg hunt within our loop space at our campsite. I was worried that other kids would come and take my kids' eggs! I mean, what would I say??! p.s. Your decorations are so cute! You put me to shame. Hi, just found you from MGH. I thought this post was funny because I just did one similar--I had 22 eggs per kid and it took forever.